I have been doing some research on the possibility of installing an OEM K04 from a Golf R/S3 onto our cars. There is a lot of conflicting information on whether or not it will fit or not. APR takes an OEM K04 and machines off the welded DV port, removes turbo muffler, and provides a cut port cover. Diverter valve: this can be relocated without any issues; going around the machined port. I don't believe there are any negative implications of this aside from more plumbing and potential cause of leak if you install it incorrectly. I do think there are advantages to it, but I am still researching that. Turbo muffler: it appears as though this needs to be hacked off to fit on the block. All indications point to this. HPA, APR, AWE, and CTS all remove the turbo muffler and fabricate a new 2.5" flange. 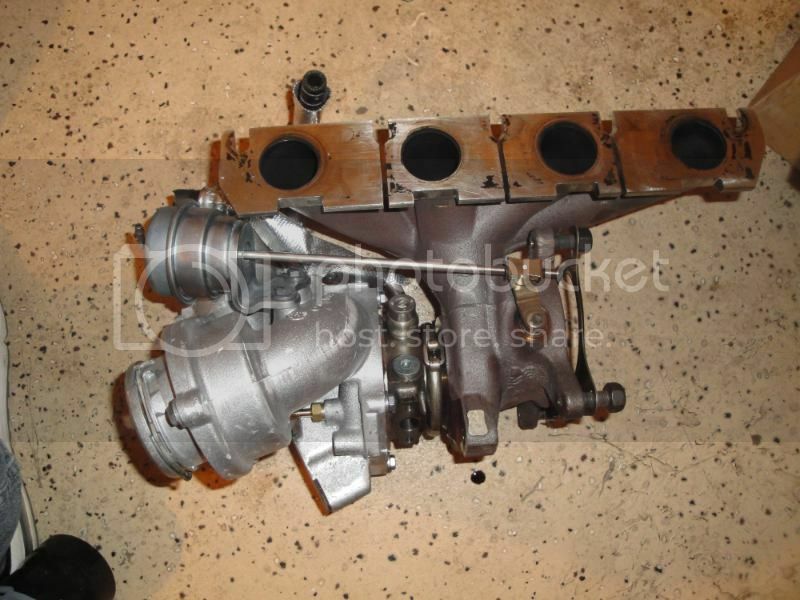 We also remove the turbo muffler to accomodate an HPA designed CNC machined fitting allowing the outlet pipe of the turbo to be rotated to clear the block, and to increase airflow out of the unit. This has the added side effect of a less muffled and smoother air stream exiting the turbo. PCV Port cover: this needs to be blocked off as its not needed on the TSI motor. Aside from replacement hardware, and oil/coolant, you will also need to source a silicone hose that attaches to the turbo outlet. APR provides one of these for you in the kit. Don't forget hose clamps to go with that. I just wanted to get a discussion going to see if anyone has done this and how these difficulties were delt with. Please do not come in here and say, "just buy APR's kit and be done with it." I am trying to explore other options. 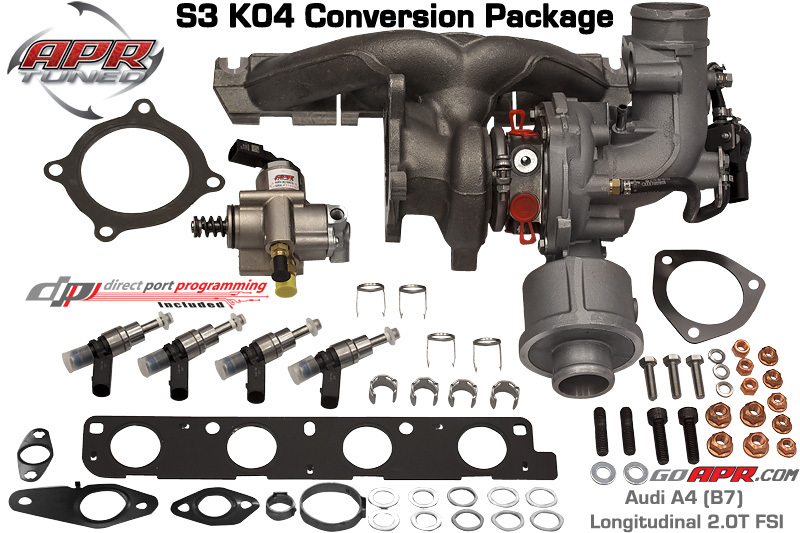 *APR Stage 3 (stock) removal & install instructions - Worth noting they remove the turbo from the bottom which requires the drive shaft to be removed. All other guides suggest the top. Last edited by lilfleck; 07-29-2013 at 09:34 AM. ..."apparently" killed it for me. Does the R K04 have a turbo muffler? Here in South Africa a lot of guys are running the OEM K04 from a Golf R/S3. The muffler is removed and a straight piece welded on (this allows it to clear the head) and also the PCV inlet is blocked off. Then the DV is relocated using either the OEM DV relocation kit or a Forge DV relocation kit. Perfect. That is what I was looking for. Could you elaborate more on the modifications needed? Can you remove the muffler w/o cutting? Do you weld on any type of metal fitting that you can attach a hose to? How are you going to block the PCV inlet? Regarding the DV relocation kit, I don't see one from Forge that is for the 2.0t. AWE has a relocation kit, but I am considering going a custom route. IE sells the pcv block off plate. Muffler needs to be cut because it's the housing so to speak that won't clear. You are better off going custom for the dv relocate imo. There are threads on here that tell you everything that you need to buy and what to do with them. Basically just a piece of tubing needs to be welded on to extend it so the boost hose can be installed over it which is 2" if I remember right. There isn't any more to elaborate on. Cut muffler off, weld on an outlet that will work with the stock TOP. You can find very detailed information as to how APR achieves these three things if you just search. You can even find a picture of a k04 with a different outlet welded on, to show you exactly what you need to achieve. Great, so I can source the block off from IE, thank you sir. Does anyone know what size the turbo outlet pipe is? As long as something needs to get welded on, I wonder what's the cleanest way to do this. Found out outlet is 2.5" -- same w/ intake side. It doesn't look as bulky as the one pictured from APR. Wonder if it will fit. wizz wheel if you are good with them band saw could work people like cutting with a grinder but I'm not good with the grinder a sawzall could work anything that cuts metal just use what ever you are most comfortable with. Like the guys said just search you'll see how it gets completely cut off. I bought mine already machined to fit the TSI, and PCV already blocked off. And I have a 90 degree silicone bend which will attach to a Neuspeed discharge pipe for K04. I have a Forge DV relocate pipe (That will run from a Pipercross stage 2 inatke pipe with DV bung) over the motor to the throttle pipe. From there I'm I'm using OEM VW parts (My DV, the DV holder and another small silicone pipe that goes to the throttle pipe) and the DV wiring harness will be rerouted from the original location through the coilpack wiring harness to the front of the motor so no cutting or splicing. On REVO 3 on 95ron we are getting 330whp and 520nm on the wheels.